Potentiation, habituation, and sensitization are three ways in which stimuli in the environment produce changes in the nervous system. “Potentiation” refers to a strengthening of a nerve synapse. Long-term potentiation is based on the principle that “cells that fire together, wire together,” and is widely considered one of the major cellular mechanisms that underlies learning and memory. Habituation occurs when we learn not to respond to a stimulus that is presented repeatedly without change, punishment, or reward. Sensitization occurs when a reaction to a stimulus causes an increased reaction to a second stimulus. It is essentially an exaggerated startle response and is often seen in trauma survivors. During habituation, fewer neurotransmitters are released at the synapse. In sensitization, however, there are more pre-synaptic neurotransmitters, and the neuron itself is more excitable. axon: A nerve fiber that is a long slender projection of a nerve cell, and which conducts nerve impulses away from the body of the cell to a synapse. dendrite: A slender projection of a nerve cell that conducts nerve impulses from a synapse to the body of the cell. stimuli: In psychology, any energy patterns (e.g., light or sound) that are registered by the senses. Learning occurs when stimuli in the environment produce changes in the nervous system. Three ways in which this occurs include long-term potentiation, habituation, and sensitization. One way that the nervous system changes is through potentiation, or the strengthening of the nerve synapses (the gaps between neurons). Long-term potentiation (LTP) is the persistent strengthening of synapses based on recent patterns of activity: it occurs when a neuron shows an increased excitability over time due to a repeated pattern, behavior, or response. The opposite of LTP is long-term depression (LTD), which produces a long-lasting decrease in synaptic strength. The structure of a neuron: Communication between neurons occurs when the neurotransmitter is released from the axon on one neuron, travels across the synapse, and is taken in by the dendrite on an adjacent neuron. Because memories are thought to be encoded by modification of synaptic strength, LTP is widely considered one of the major cellular mechanisms that underlies learning and memory. The role of LTP in learning is still being researched, but studies on the hippocampus have found LTP to occur during associative learning (such as classical conditioning ). LTP is based on the Hebbian principle: “cells that fire together, wire together.” This principle attempts to explain associative learning, in which simultaneous activation of cells leads to pronounced increases in synaptic strength between those cells, and provides a biological basis for the pairing of stimulus and response in classical conditioning. Recall that sensory adaptation involves the gradual decrease in neurological sensory response caused by the repeated application of a particular stimulus over time. Habituation is the “behavioral version” of sensory adaptation, with decreased behavioral responses over time to a repeated stimulus. In other words, habituation is when we learn not to respond to a stimulus that is presented repeatedly without change. As the stimulus occurs over and over (and as long as it is not associated with any reward or punishment), we learn not to focus our attention on it. It is a form of non-associative learning that does not require conscious motivation or awareness. Habituation helps us to distinguish meaningful information from the background. For example, an animal may be startled when it hears a loud noise, but if it is repeatedly exposed to loud noises and experiences no associated consequence, such as pain, it will eventually stop being startled. Habituation to stress: Habituation involves responding to stimuli and stress less over time—after our body’s initial natural resistance to the stimuli. Sensitization is the strengthening of a neurological response to a stimulus due to the response to a secondary stimulus. For example, if a loud sound is suddenly heard, an individual may startle at that sound. If a shock is given following the sound, then the next time the sound occurs, the individual will subsequently react even more strongly to the sound. It is essentially an exaggerated startle response, and is often seen in trauma survivors. For example, the sound of a car backfiring might sound like a gunshot to a war veteran, and the veteran may drop to the ground in response, even if there is no threat present. Habituation and sensitization work in different ways neurologically. 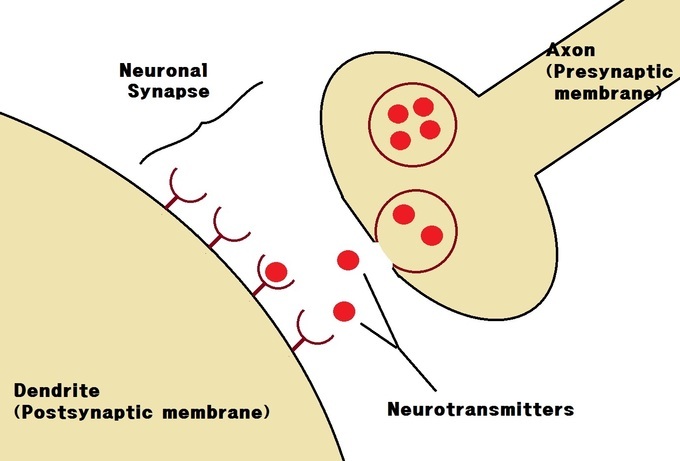 In neural communication, a neurotransmitter is released from the axon of one neuron, crosses a synapse, and is then picked up by the dendrites of an adjacent neuron. During habituation, fewer neurotransmitters are released at the synapse. In sensitization, however, there are more pre-synaptic neurotransmitters, and the neuron itself is more excitable. Neural communication: This image shows the way two neurons communicate by the release of the neurotransmitter from the axon, across the synapse, and into the dendrite of another neuron.